The planet Hsin, which is riven with a bloody civil war. Anything Middenface can lay his hands. The Gronk mostly refuses to use heavy ordinance. The Gronk: "Oh, my poor heartses." Middenface is a knobble-headed Scotsman with two great loves - a wee dram and putting the head on those he dislikes. 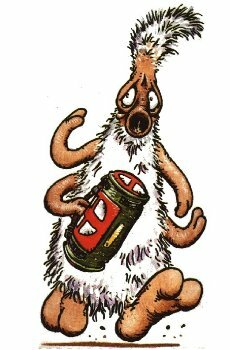 The Gronk is a kindly alien, now acting as an affiliate to the other Strontium Dogs. Normally Strontium Dogs operate on a strictly creds-only basis, finding and executing warrants on wanted felons. However recent events (see Series Update) have given them other priorities. Feral, a Strontium Dog who is crippled by a progressive mutation. This has gone so far that Feral has reverted to a cocoon state. Bullmoose, also a Search/Destroy Agent. Ho, X'ian and Viper - three guerilla fighters in the Hsin civil war who have teamed up with Middenface. The Gronk and Bullmoose have travelled to Hsin in search of Kingsblood, a herb the Gronk hopes will cure Feral (see Associates above). On Hsin the pair team with Middenface and his guerilla fighting friends. On the planet Hirfu, Feral is sought by the Alphabet Men for killing one of their men.